Frozen! It's everywhere! And just about every kid who has seen the movie just loves it... my kids included! We must have seen the movie over a hundred times :). 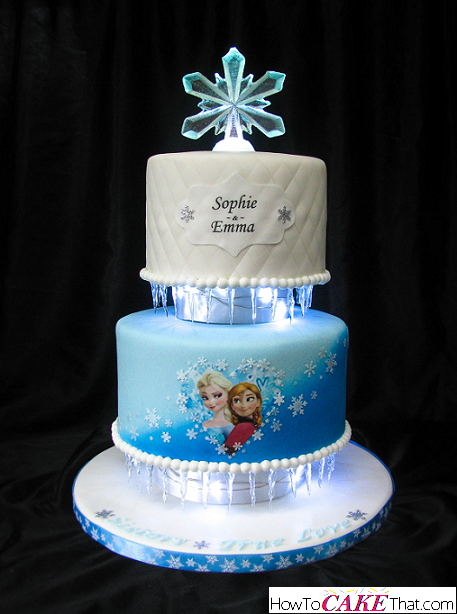 So when a request came in to make an Anna and Elsa "sisters" theme cake for two sweet girls, I was super excited! They requested a special message on the cake, along with the girl's names, and for the colors on the cake to be blue, white, and silver... like snow. Immediately my mind imagined icicles, snowflakes and LED lights to make them glow... because kids are drawn to beautiful lights! 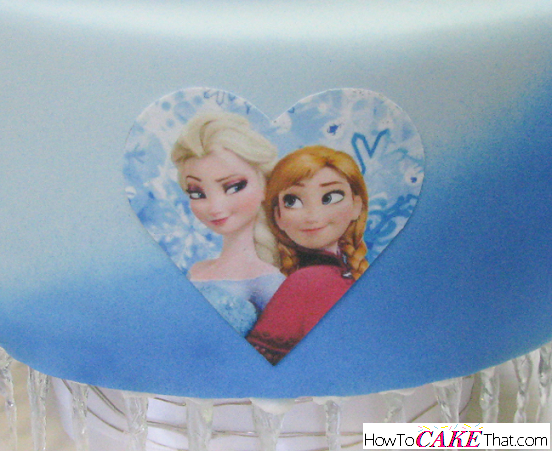 In this tutorial, I'll give you an overview of how this cake came together! 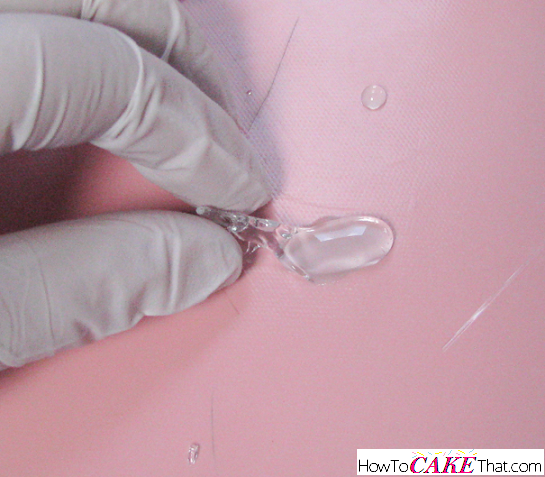 Note: This tutorial does have a bit of isomalt work in it, so if you do not have experience with it, I recommend taking a class (or doing a whole bunch of research) before attempting any of the isomalt work in this tutorial. This stuff is very hot and if not handled properly it can cause severe burns. When creating cakes, I like to spread out the work as much as I can over several days. That way it won't be so much work all at once and I avoid losing a full night's sleep. To get an early start, I decided to work on the Styrofoam spacers that will sit under each tier. I started working on them about a week before the cake was due. Since the top tier of my cake will be 6" and the bottom tier 8", I will need a 4" spacer (to go under the 6" cake) and a 6" spacer to go under the 8" cake.... these spacers are about 2 inches in height. These sizes will give me an inch of overhanging cake all around. This will be plenty of room for installing the lights and hanging icicles. Since the 4" Styrofoam spacer will need to rest on top of the 8" cake, it will need to be doweled to support the top tier and keep it from sinking into the 8" cake. And to keep the dowels from puncturing the Styrofoam separator under the weight of the top tier, we must attach a cardboard cake round to the underside of the Styrofoam separator. 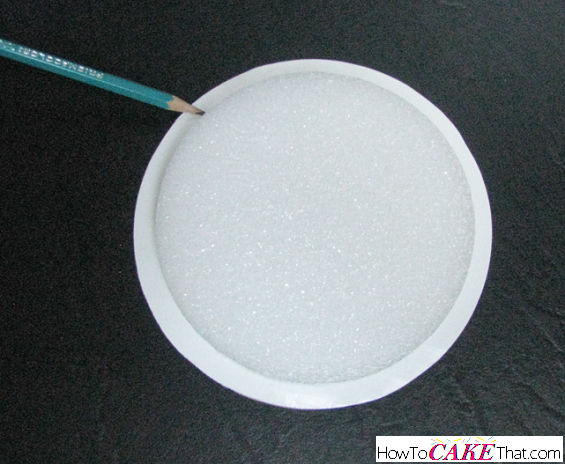 To do this, place the 4" round Styrofoam in the center of a cardboard round and trace around the Styrofoam with a pencil. Next, using a sharp pair of scissors, cut out the traced 4" cardboard cake round. Note: the above steps are for the 4" round Styrofoam only. 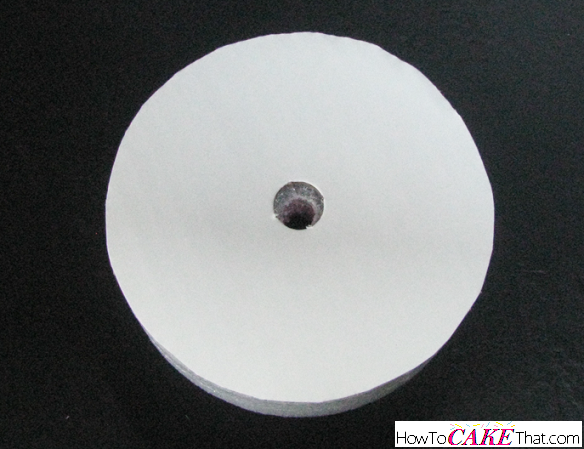 The 6" round will be sitting on the flat cake base and therefore does not need a layer of cardboard protection. Wilton's new cardboard cake rounds have a precut hole in the center, which helps line up where we will need to drill a hole. A large wooden dowel will need to run through the center of the entire cake (including separators) to keep the whole thing steady. 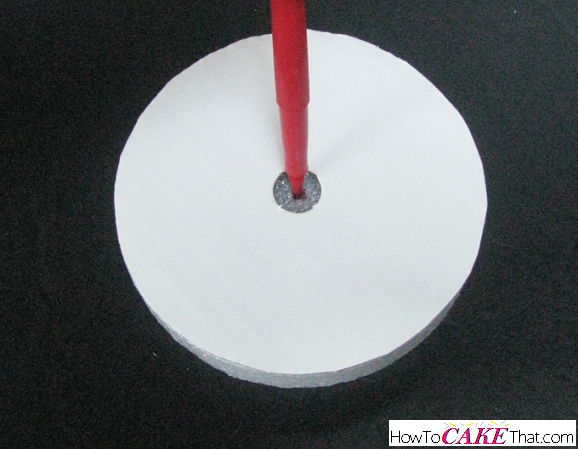 Place the cardboard cake round on top of the Styrofoam and mark where the center is. 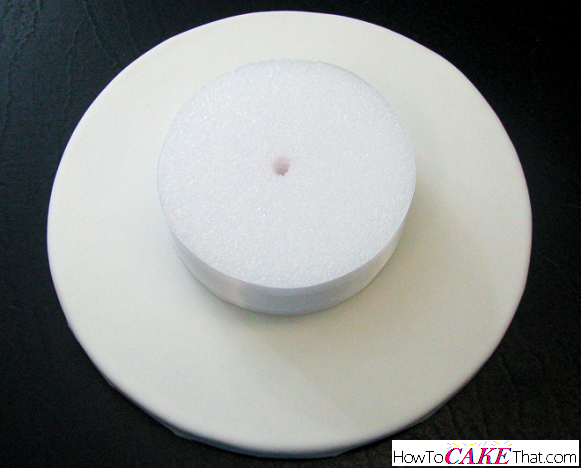 Repeat this step with the 6" Styrofoam cake separator. The separators I purchased came in two 1" high pieces, which makes it perfect for hiding the battery pack of my LED string lights. I found these awesome lights at my local JoAnn Fabrics store in the floral department. These lights are operated by two coin batteries which makes the battery pack ultra slim. To hide the battery pack between two Styrofoam layers, we will need to carve out a little notch for it. Designate a "back" side of the Styrofoam separators and set the battery pack on the inside of the Styrofoam circle, ensuring the on/off switch sits right at the edge. Trace around the battery pack to give yourself a trimming guide. Using an Xacto knife, trim out a shallow space for the battery compartment to sit. When the separators are sandwiched together, it should be a perfect fit with the switch easily accessible. Once it is determined that the battery compartment cutout is a perfect fit, it's time to glue the two Styrofoam halves together. I just used Elmer's Glue-All nontoxic glue. Repeat these steps with the 6" Styrofoam separator. Once the glue inside the separators has completely dried, it's time to drill a hole through the middle of the Styrofoam separators. 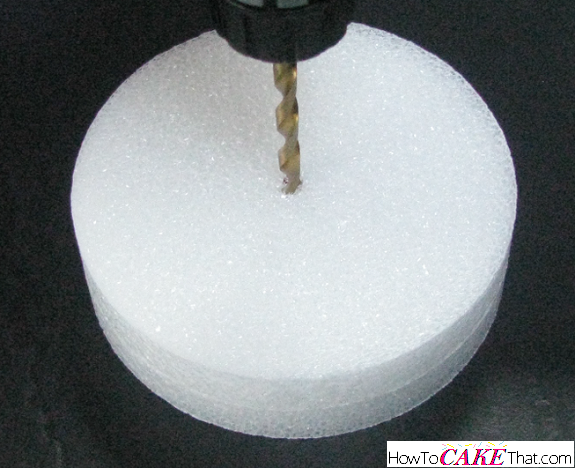 Using the center dot that was marked earlier, drill a hole through both the 4" and 6" Styrofoam separators using a spiral drill bit that is slightly wider than the wooden center dowel you will be using to support the entire cake. Predrilling this hole will not only make it MUCH easier to insert the dowel through the entire cake, it will also prevent any Styrofoam bits from getting into the cake. Note: it is very VERY important that this hole is completely center. Next, it's time to glue the 4" round cardboard cutout onto the Styrofoam separator. Now to add the final touch, I used double-sided tape to attach a wide white ribbon around the Styrofoam separators. I also cut a slit in the ribbon to allow for the LED lights battery compartment to be inserted into the separators after the cake has been stacked and fully doweled. Also a few days before the cake was due, I created my own mold for the cake's snowflake topper. I wanted to create the topper out of isomalt, so the mold making material needed to be able to withstand high temperatures, and also be food safe. So I used Amazing Mold Putty and created a silicone mold around a snowflake ornament I picked up at my local Michaels. Once mold had set, I removed the ornament and washed with warm soapy water and let dry. Also on this same day I rolled out white fondant and covered my cake base and set it aside to dry. The morning before the cake is due, I baked a 6" round cake and an 8" round cake. Both cakes will sit at about 4 1/2 inches in height after they have been filled and frosted. While the cakes are resting, it's time to begin the isomalt work. 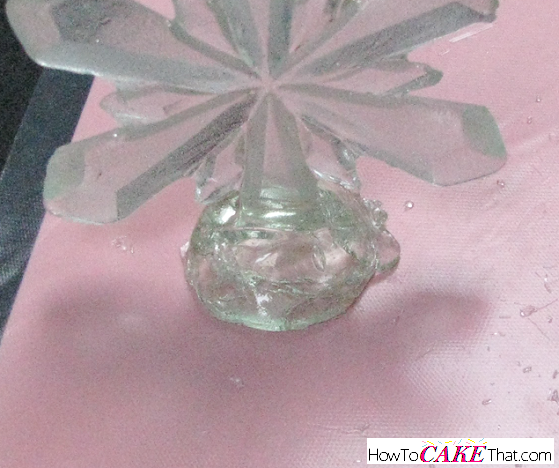 I chose isomalt for this tutorial instead of my edible glass recipe because isomalt is easier to work with when it comes to shaping, and it can be reheated over and over again until all of your sugar work is complete. And it also is crystal clear... unlike the edible sugar recipe that can have a lightly yellowish tint to it. 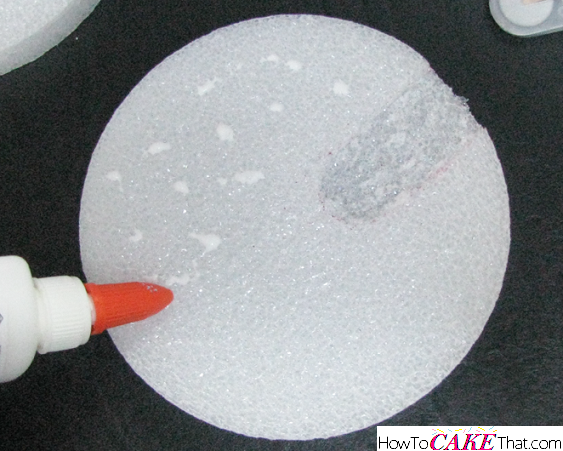 I purchased raw granulated isomalt by CK Products and prepared it ahead of time. 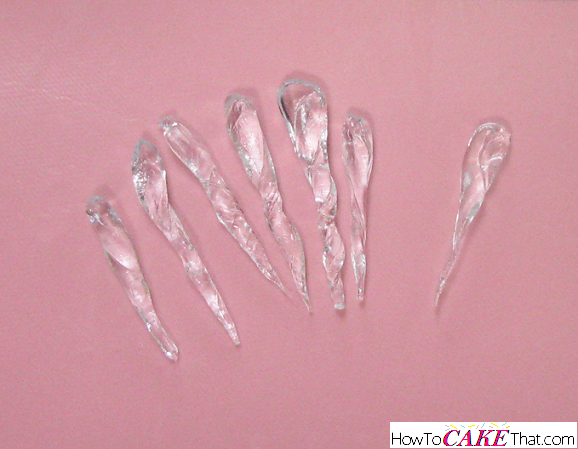 To avoid the pre-cooking step, Isomalt Nibs can be purchased to save time, but they are a little more expensive. 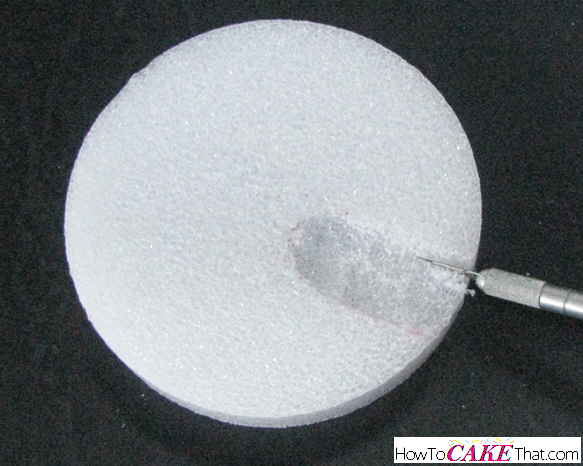 If you have raw granulated isomalt, prepare according to the package instructions and pour hot cooked isomalt onto a silicone baking mat or a pan lined with parchment paper and let cool. Once cooled, it can be broken up into small pieces to be reheated for later use. 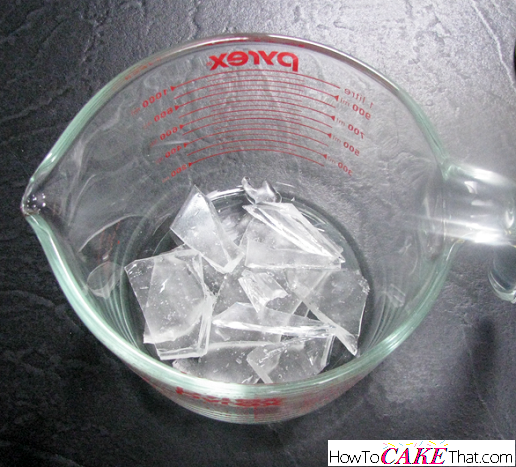 When it's time to use the isomalt, place pieces into a microwave-safe measuring cup and heat in the microwave in 30 second increments until completely melted (reduce microwave time as the isomalt gets closer to being fully melted to keep it from burning, to about 10 seconds or so). 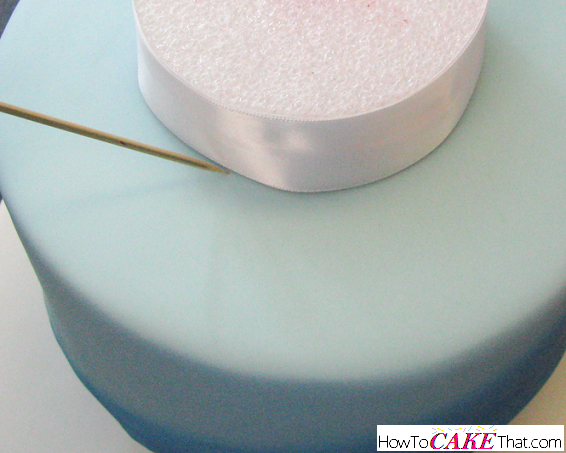 Be sure to stir isomalt between heating times. Once my isomalt was melted, I tinted it with the tiniest touch of Wilton's royal blue food coloring. Stir to mix in color. FYI: the blue gel will start to appear green the more it's reheated. If I were to go back and do this cake again I may have just left the isomalt clear. With the isomalt still very hot (but the bubbles have settled a little), I poured the isomalt into the one-sided mold I created with the Amazing Mold Putty. 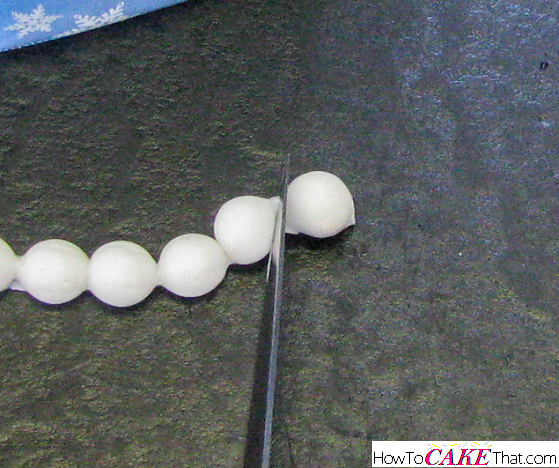 Working quickly, I used a tiny pin to push some of the isomalt up into the smaller points of the snowflake. 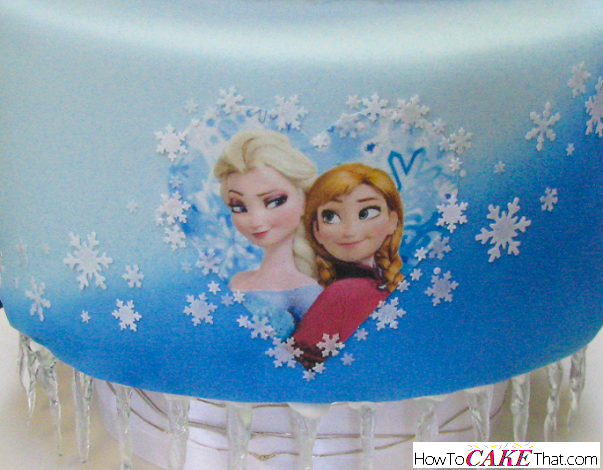 Allow snowflake to completely cool and set before trying to remove it from the mold. While the snowflake is cooling, it's time to create the icicles! 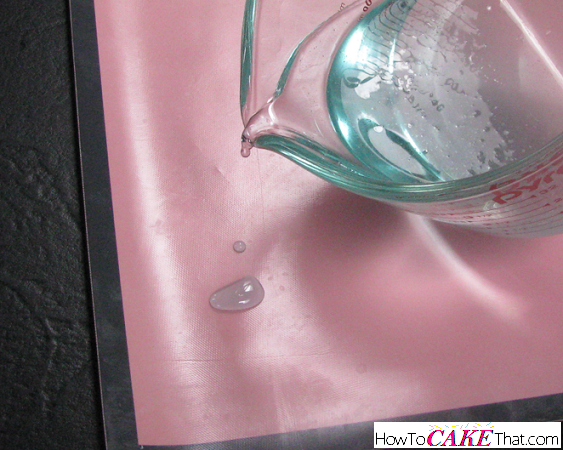 Reheat the isomalt if necessary, and pour out a tiny bit onto a nonstick silicone baking mat. 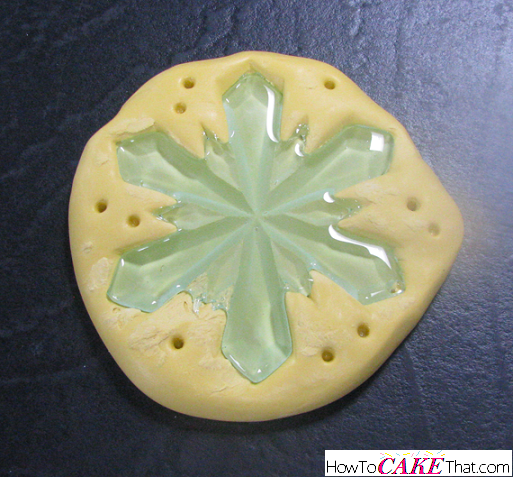 Allow the isomalt to sit until the edges begin to have a taffy-like texture. 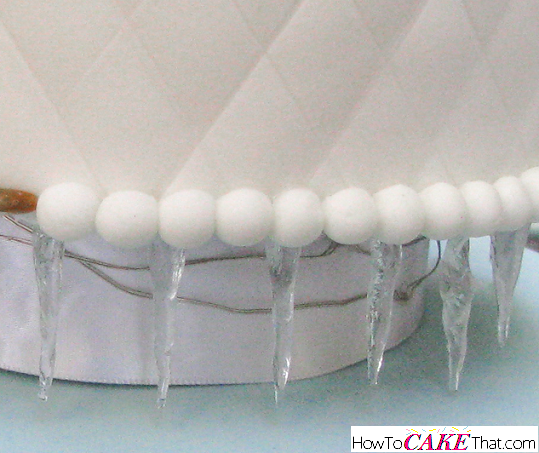 Using food-safe gloves, pinch up the end and carefully begin twisting out an icicle shape. Be super careful with this! This stuff is crazy hot!! I made my icicles about 1 1/2 to 1 3/4 inches long (slightly shorter than the 2" Styrofoam spacers will give me). I wish I could have taken more photos of the icicle making process, but you have to work very quickly with this stuff. It cools and hardens quickly! But maybe I'll make a quick video for you guys after the New Year... what do you think? Look at that! Aren't they gorgeous?! Only Isomalt can give you that realistic perfectly clear appearance! For my cake I made about 42 of these things! I could only create about 2 to 3 of them for each small puddle of isomalt I poured because the isomalt would cool so quickly. 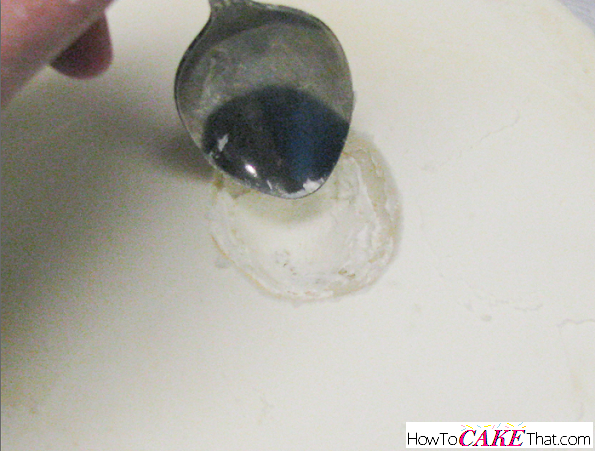 Pour more puddles (1 at a time) and make more until the large amount of isomalt in the measuring cup cools. 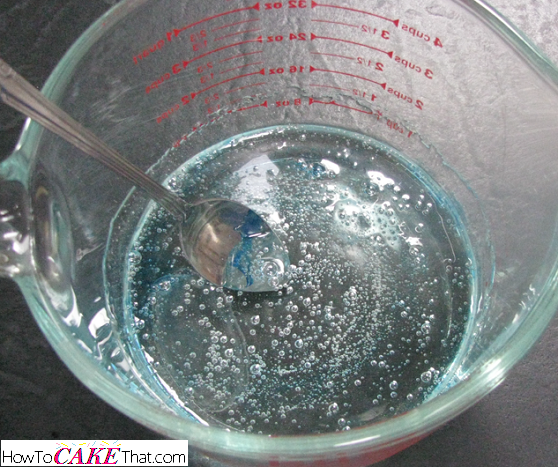 Once that happens, just put your other isomalt scraps back into the measuring cup and reheat! 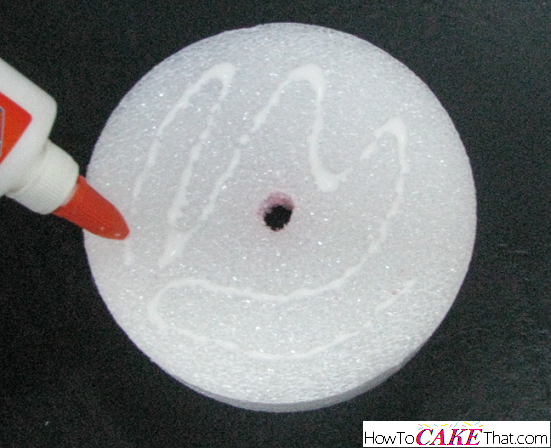 Once the snowflake topper has set, remove it from the mold. The silicone mold gave the shaped side of my snowflake a frosted appearance. At first I was a little disappointed that it wasn't crystal clear, but after I held up the LED light underneath of it I was thrilled with its frosted appearance! I actually prefered it that way! So I decided to use the flat side (the clear side) of my snowflake as the front of my topper. 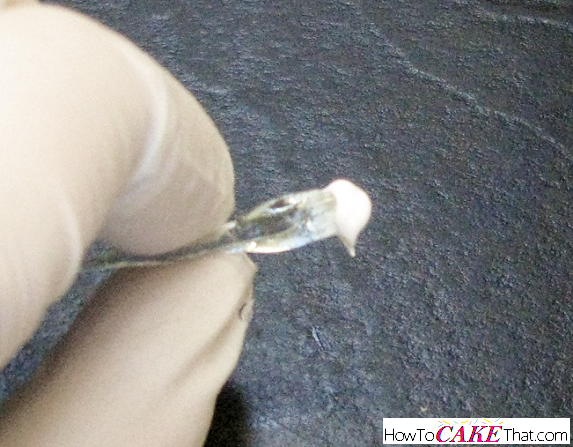 I then poured a little hot isomalt onto the silicone mat. Once the isomalt reached the taffy-like stage, I began shaping it around the base of my snowflake. 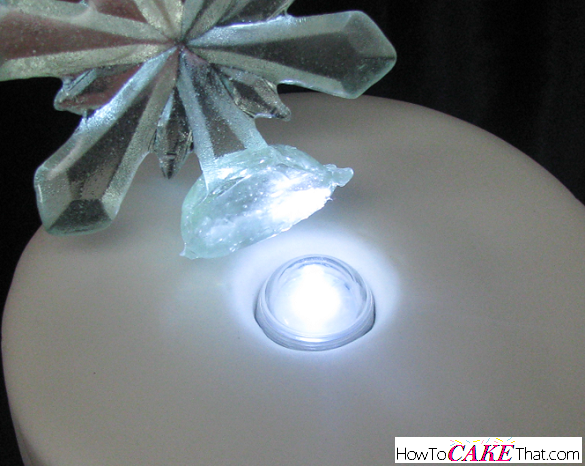 Once it started to set, I grabbed my LED light (which sits in a round plastic capsule) and gently pressed it into the underside of the isomalt base, to give the base a slight indentation underneath and ensure the snowflake topper would be able to sit over the light. Most of the LED capsule will be below the cake's surface, but a small amount will be sitting above the surface, and I wanted to be sure the topper and light would fit together nicely. Once the cakes have been frosted and chilled in the refrigerator, it's time to create a place for the LED light capsule to sit. 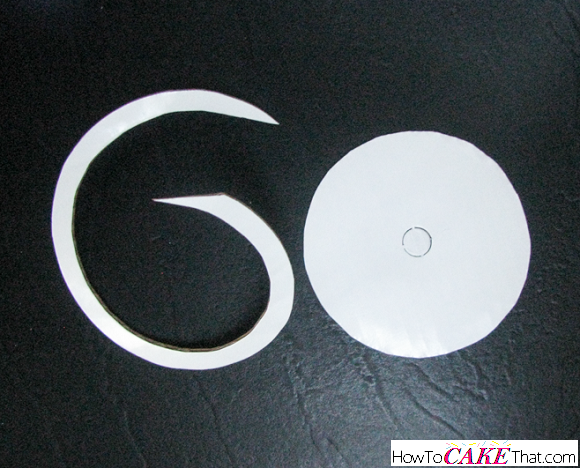 Remove the 6" cake from the refrigerator and place a 6" cardboard round on top of the cake. 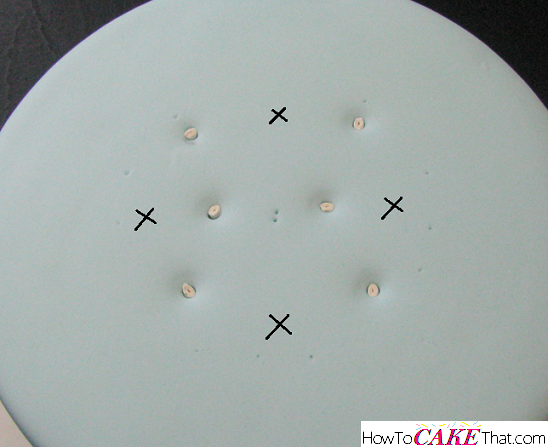 Used the punched out center hole as a guide and mark the top of the cake with a knife. Note: be sure both the 6" and 8" cakes are on cardboard rounds the exact size of the cakes. This will help support the cake that will be hanging over the Styrofoam separators, and it will also give the icicles something to cling to. Using a small spoon, scoop out an area slightly larger than needed for the LED light capsule. Remember, there will be fondant covering the cake, so we need to accommodate for the extra room the fondant will be taking up. Lightly line the inside of the hole with a little frosting... this will help the fondant stick to the inside of the hole. Roll out white fondant and cover the 6" cake. 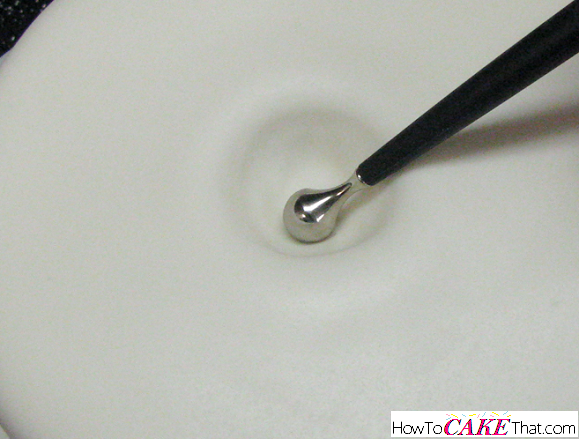 Smooth down fondant over cake. 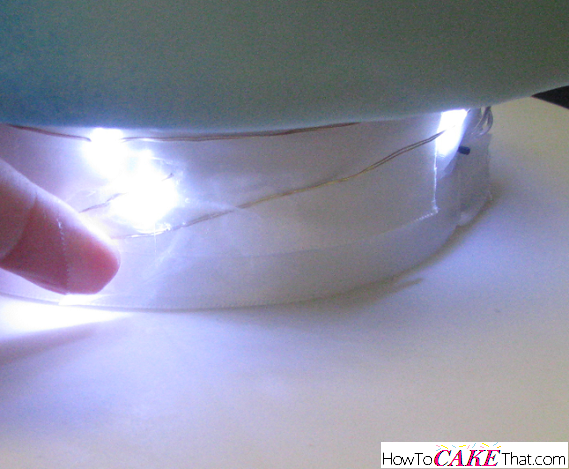 Next, use a pin to poke a small hole right in the top center of the cake (where the LED light capsule hole is). This pin hole will give the air somewhere to go and prevent air bubbles when we smooth down the fondant inside the hole. 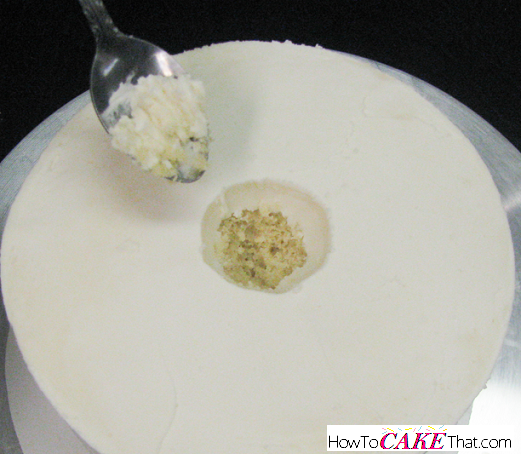 Use a ball tool to shape the fondant down into the hole. Begin working from the outside edge and slowly work your way to the middle. 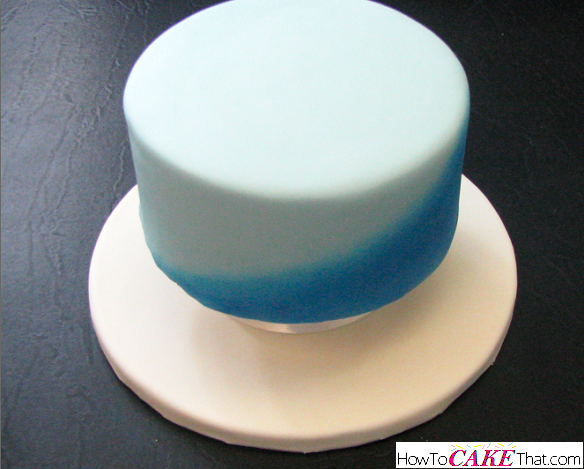 For the 8" tier, I colored the fondant a pretty light blue shade using Wilton's Royal Blue gel color. 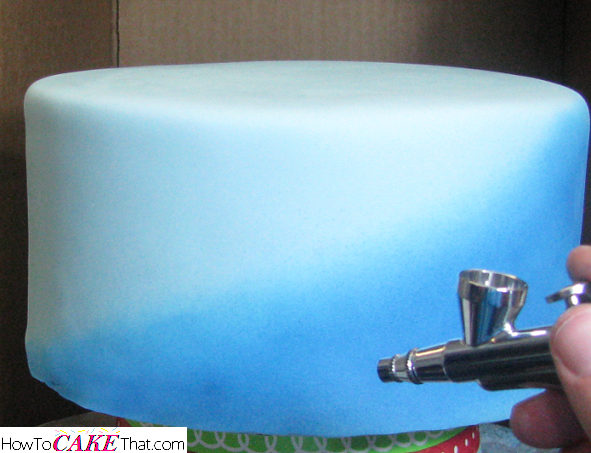 To make the cake a two-tone, I airbrushed a bottom angle of the cake with Duff's airbrush color in blue. Now my airbrush is a little cheap one and instead of leaving a little fine misted line between the light and dark blue colors, it ended up being a little spotty. I wasn't happy with that, so I took a blue petal dust and a large puffy soft brush and dusted over where I airbrushed to give it a smoother appearance. This two-tone design probably could have been done using the petal dust alone! It probably would have given me better results if I had just avoided the airbrush altogether. Anyway, the petal dust I used was "For-Get-Me-Not" by The Sugar Art. Now for the exciting (and scary) part! It's time to begin stacking the cake! I placed the fondant covered cake base on the counter. Next, I melted down a little Wilton's candy melts in white and smeared just a tiny bit where the Styrofoam cake separator will sit. I quickly placed the 6" Styrofoam separator on the base and lined it up perfectly center before the candy melts could set. Next, I lifted and set the 8" tier onto the 6" separator. 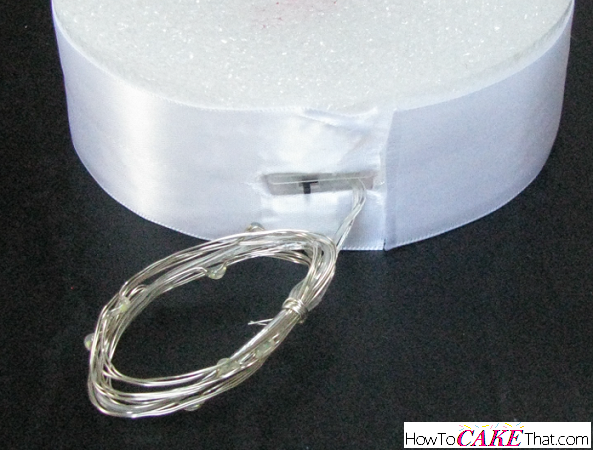 Ensure that the slot where the LED battery pack will go is sitting at the back of the cake. Now it's time to prepare the cake for the 4" separator. To do this, place the Styrofoam separator on the 8" tier. Line up the separator so it is perfectly centered. Using a bamboo skewer, I lightly marked the outside edge of the Styrofoam separator so I will know where to place the dowels. Next, I placed a single dowel (I like using Wilton's lollipop sticks) and used a pencil to mark where the dowel meets the surface of the fondant. I removed that dowel from the cake and lined it up along with all of the rest of the dowels I would need to support the separator. I made the same level mark across all of the dowels and trimmed them to the same size. Now because we need to support a heavy cake with something that is two inches smaller, we will need to dowel the heck out of the cake underneath to ensure it remains stable. Originally I placed only 6 dowels into the 8" cake, but when I placed the 4" spacer and 6" tier on top of the 8" cake, it was a bit wobbly. So I removed the top tier and separator and added 4 more dowels. The X's in this photo represent where I added the extra dowels. And those extra dowels made all the difference! Melt down a little more Wilton's white candy melts and smear just a little bit over the dowels where the 4" separator will sit. Place the 4" Styrofoam separator, cardboard side down, onto the dowels and melted candy melts. Ensure to quickly center the separator. Next, smear a little more melted candy melts onto the top of the 4" separator and place the 6"cake on top of the separator... center it perfectly. Note: be sure to leave the very center of the cake open (no dowels) since this will be where the large center dowel will go. 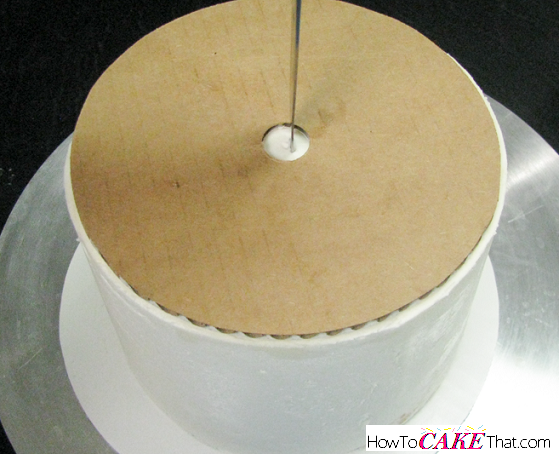 Before adding the lights, be sure to sharpen one end of the long wooden dowel and run it through the center of both cakes and separators (sharp end first) and trim so that it sits below the surface of the top cake. 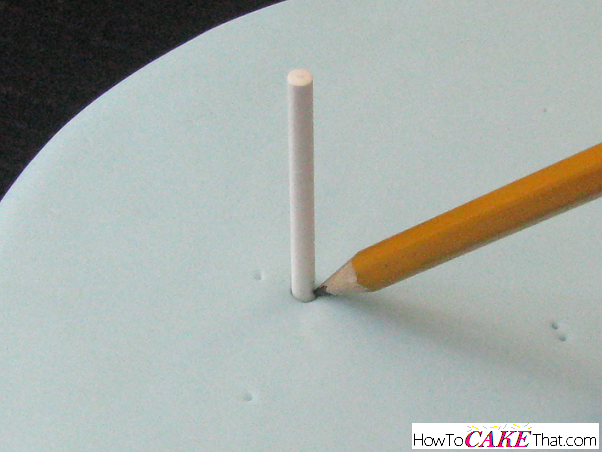 Finish it by pounding it down so that the sharpened end punctures into the cake base, making it super stable. Next, insert the battery compartment of the lights into their slots. 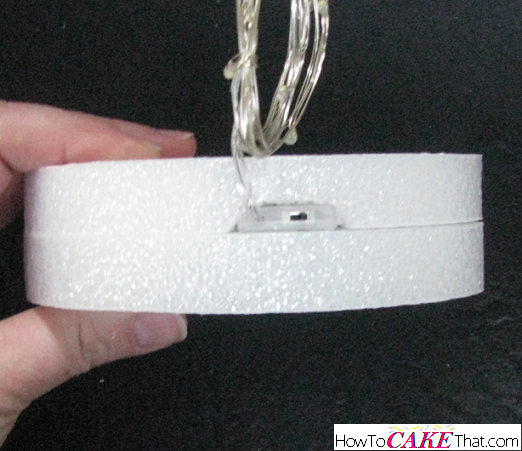 Wrap the LED lights around the Styrofoam separators and use clear masking tape to tape the end of the string into place and keeping it from becoming unraveled. 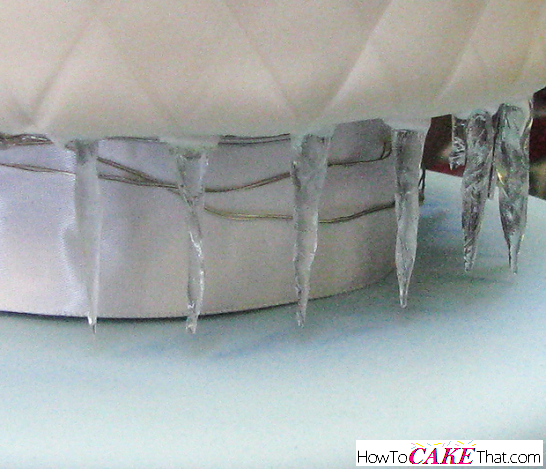 Now it's time to attach the icicles to the cardboard underside of both cake tiers. 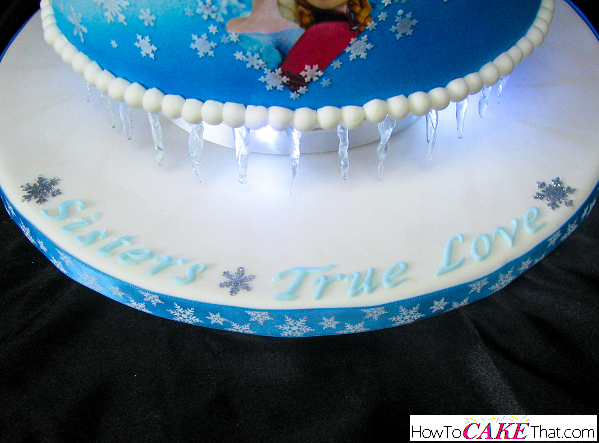 It took a few tries to find out something that would glue the icicles, but stiff royal icing did the trick! If you come across any icicles that are a little too long for your project, use a fresh razor blade to trim away excess icicle from the thick end until it is the appropriate length. Now it's time to add decorations to the 8" tier. 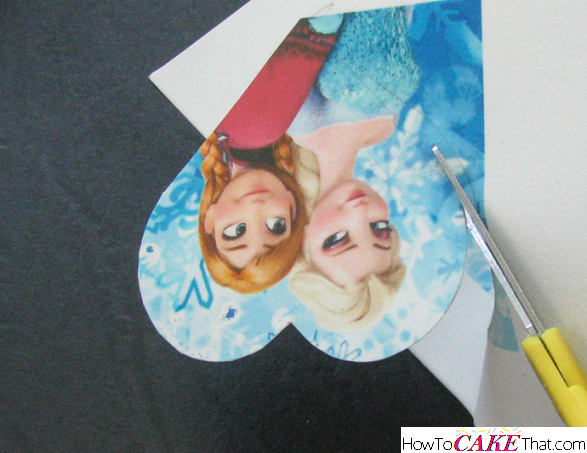 I had an Anna and Elsa edible image printed from my local cake supply store, and I used a pencil and a heart cookie cutter to trace around the picture. Next, I cut out the picture. I removed the plastic backing from the image and brushed the back of the image with piping gel. Then I gently pressed the image onto the cake. 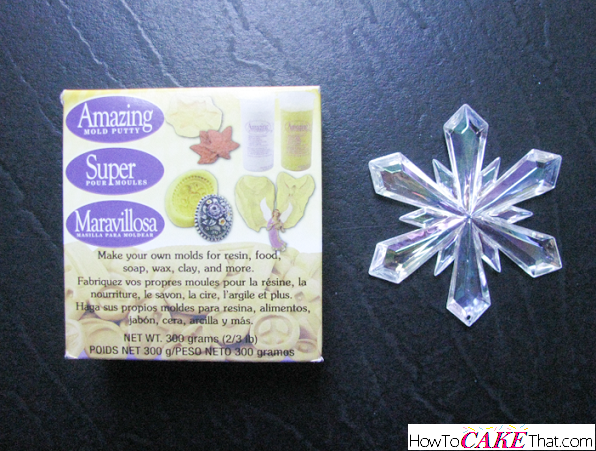 Now it's time to create the little edible snowflakes that will go around the Frozen image. 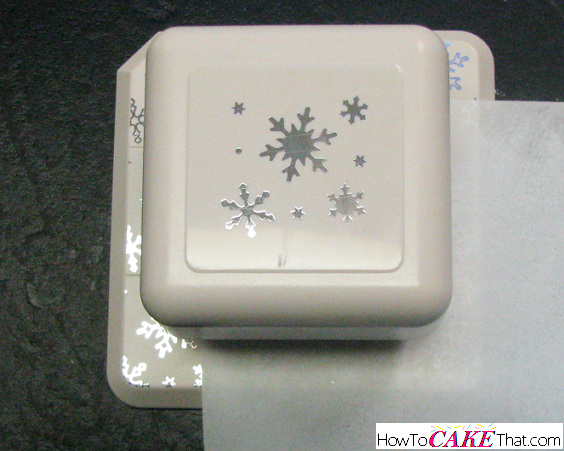 To do this I used a Martha Stewart snowflake paper punch to punch out wafer paper snowflakes. Wafer paper does not like water. So to attach the snowflakes to the cake, I brushed a tiny dot of corn syrup where each one would go, working one at a time. To make the bottom edge of both cakes look a little neater, I used the 10mm pearl mold by First Impressions to create a beautiful border. This size pearl strand was too heavy to pull this somewhat gravity defying stunt as one piece, so I cut each pearl from the strand and hung them individually using just a tiny dab of piping gel. 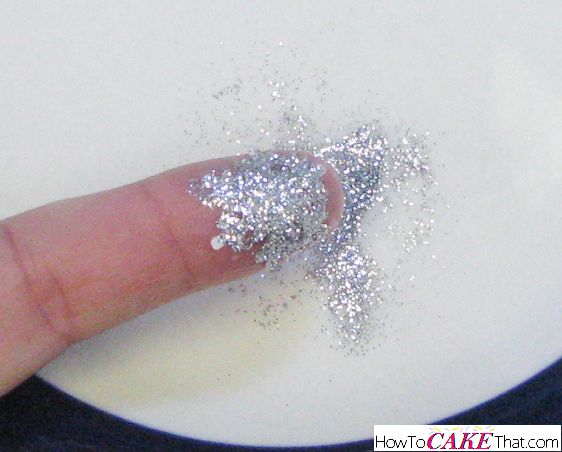 To make the silver glitter snowflakes, first sprinkle a little silver Disco Dust onto a plate. Next, buff your finger with a little shortening. Then stick one of the punched wafer paper snowflakes onto that same finger. Smooth a thin layer of shortening over the surface of the wafer snowflake. 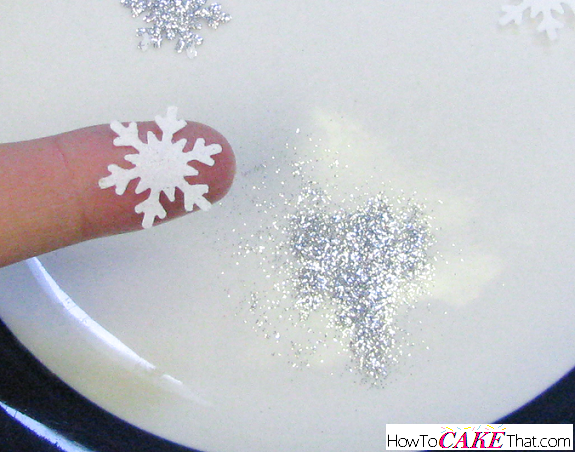 And since there is shortening on the other side of the snowflake as well, it will stick to most sugary surfaces! If you're finding you need just a little more stickage, brush the surface with just a dot of corn syrup. 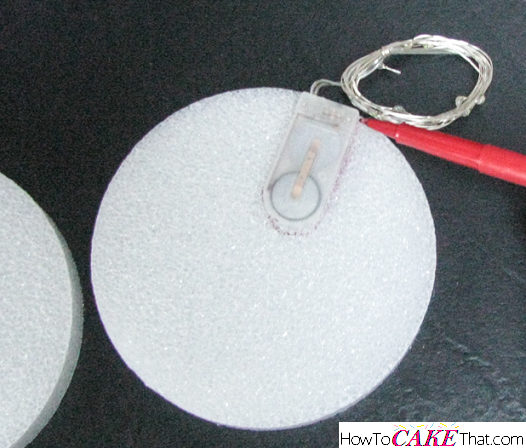 And for the last step, place the capsule LED into the little cavity on top of the 6" cake. And set the topper over the light! !